There’s a little bit of confusion on the 1929 jersey. Forever, it was tough to find a full picture of the full Tiger head jersey. Due to that, the company that gave us these drawings had to do a little guessing, coming up with the tiger head below. 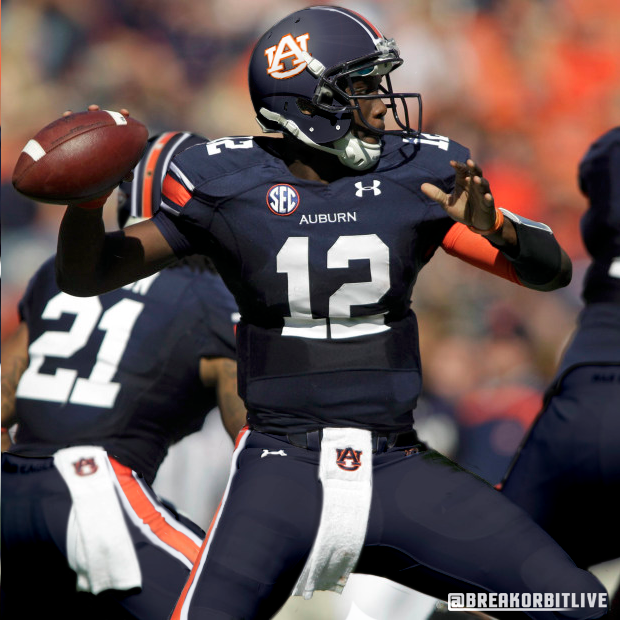 But after a nice find by @PosingPlainsmen (colorized by @aubie1), we can now see what my favorite uniform in Auburn history really looked like. Yes, that team was 2-7, but it’s a tiger head. Come on. And yes, more of the leather helmet, but what about that two-toned sleeve? 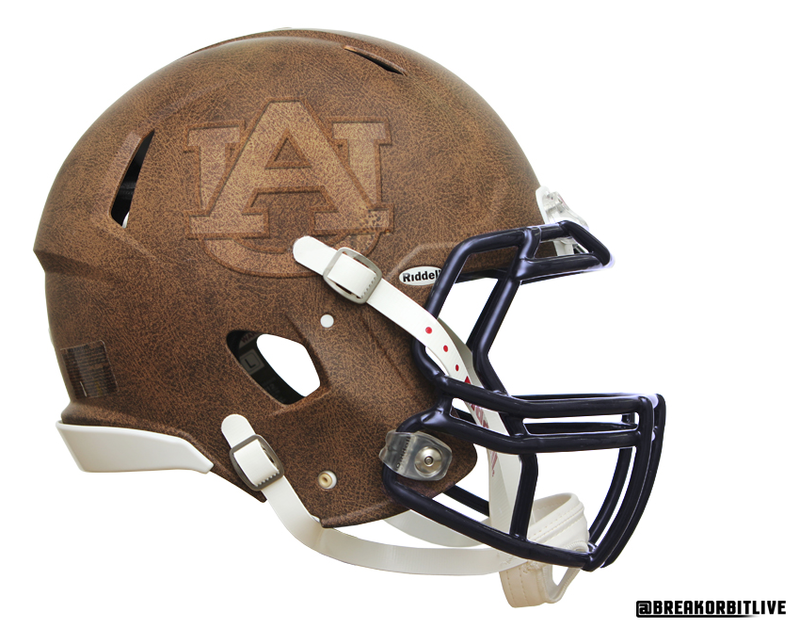 And speaking of that leather helmet, tell you me you wouldn’t put this on a bookshelf next to many leather-bound books. It screams man cave. The uniform in 1932 was pretty plain and all until you took a look at the striped helmet. This would be the most bold, but you can’t beat the orange on blue numbers. 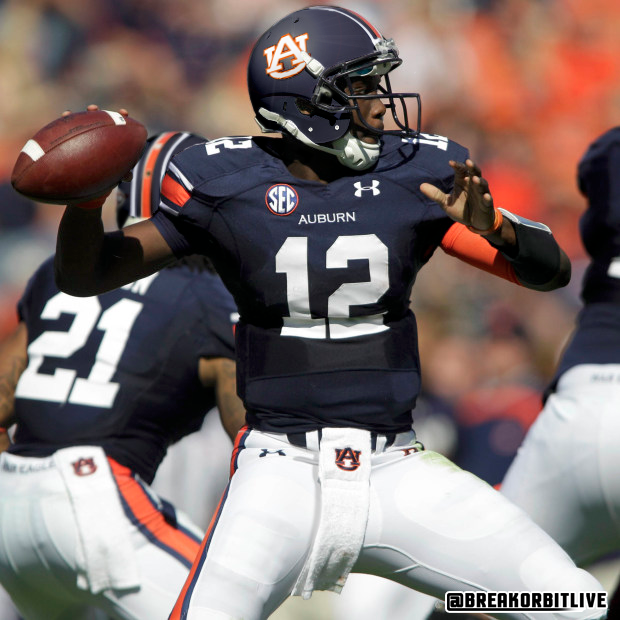 Many Auburn uniform traditionalists think that Auburn has worn orange jerseys on only three occasions, with a 1-1-1 record, back in the 70s and 80s. That is simply not true. 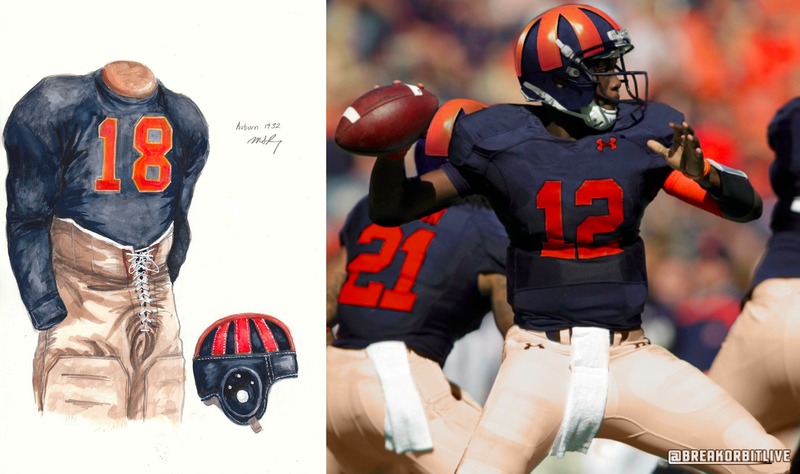 All throughout the 40’s, Auburn wore orange jerseys with a plain blue helmet AND blue pants with an orange stripe down the side. And the blue stripes on the sleeve are killer. This uniform is specifically from 1946. So now that we know what history could look like today, let’s forget the history we thought we knew that has caused us to never want a change of any kind, and look at the most talked about uniform changes of the last few years. The blue helmet rumor blew up before the 2010 Clemson game, but obviously never happened. Here’s what it would have looked like if it had. And just for fun, in the honor of the Auburn Tigers of the 1940s, let’s throw in some blue pants. And now that we know that orange jerseys aren’t nearly as rare as most thought, let’s see what they might look like today. 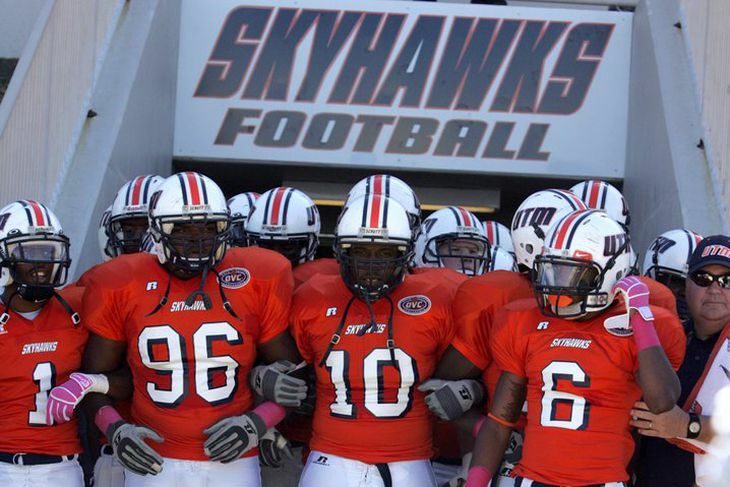 Of course we could just look at UT-Martin’s copies of Auburn-turned-orange. So there you have it. 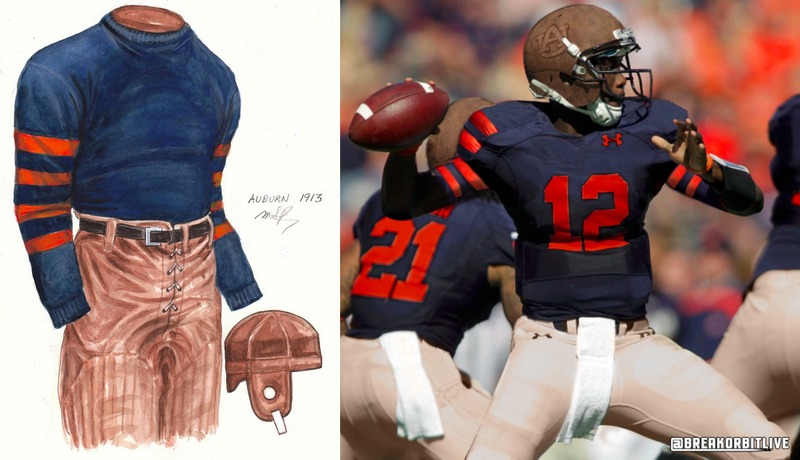 Auburn’s uniforms of yesteryear could be morphed into a uniform of today, and they wouldn’t look half bad. Let me know which one you think works best or if there are others you want done in the comments section. I think blue helmets with blue pants and white jerseys would look nice. Similar to what UGA has done with black helmets previously. 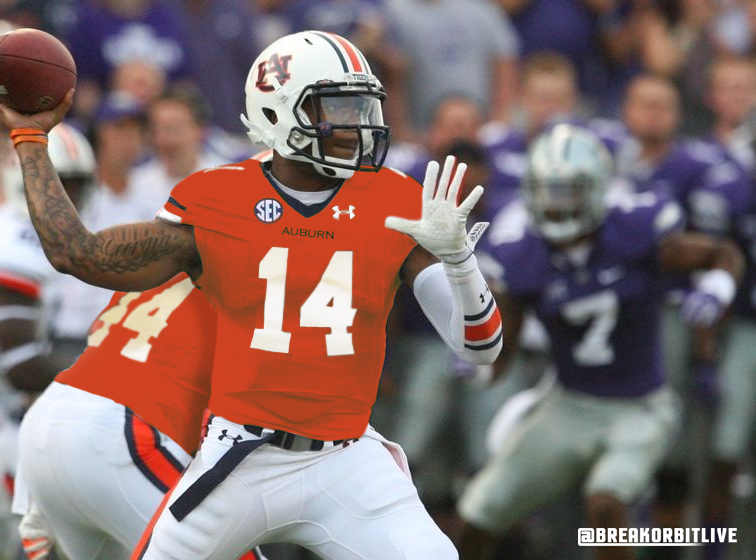 And those orange jersey aren’t too shabby! The orange jersey looks awesome. The blue helmet looks awful in my opinion. The first two throwbacks look cool too, I actually like the leather helmet look (in the context for which they would be used). Too bad we have to wait for all of the old AU dinosaurs to die before we will even think about ONE alternative uniform for ONE game. The people that freak about about this are dumb in my opinion. my favorite is the very first one pictured. i love everything about it! I want to see something a little less dramatic like the Orange facemasks from the 80’s.. I would like to see some of these throwback or alternate uniforms at least once a year. If not at home, why not wear them in the kickoff classic type games and against LSU on the road?